Several hours before, place banana in the freezer until the skins go black, remove and defrost. You’ll be left with really soft bananas. Peel, mash well and set aside. Mix the butter and biscuits together, then press into 20cm lined cake tin. Whip the cream until it just holds its shape. In a separate bowl, beat the sugar, soft cheese and vanilla together until completely combined. In another bowl, beat the peanut butter to loosen it. Fold the cheese mixture into the peanut butter, then tip in the mashed banana and gently fold in the cream. Spread the mix over the biscuit base and smooth the top. Freeze for several hours or preferably overnight. To serve, leave the cake in the fridge for 20 mins, then remove from the tin. 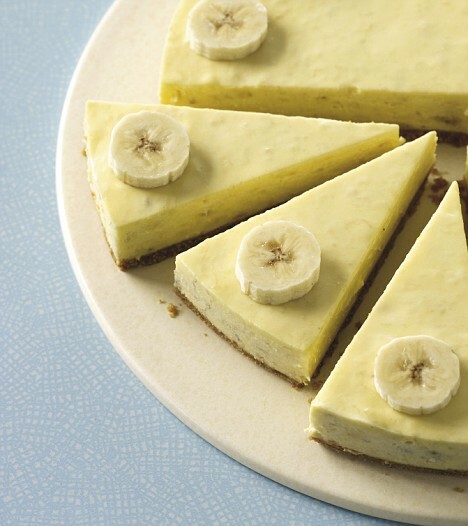 Slice banana and use to decorate the cheesecake. Gallery | This entry was posted in Recipes / Food and tagged Banana, Banana & Peanut Butter Cheesecake, Cake, Cheesecake, Food, Frozen, Peanut, Peanut Butter, pudding, Recipe. Bookmark the permalink. Pardon my French but that looks très délicieux! !